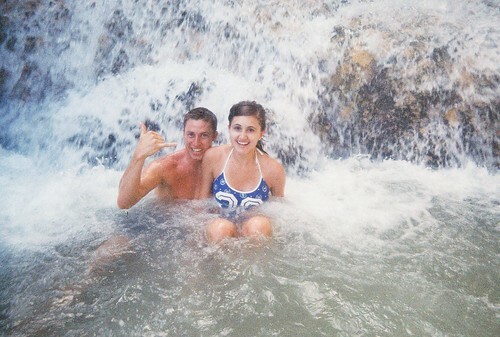 Kevin and I went on our Honeymoon to Montego Bay, Jamaica about two and a half years ago! We stayed at a Sandals resort which was all inclusive and amazing!!! I took as many pictures as Kevin would allow/handle and uploaded them to my computer! A year and a half ago or maybe two years ago, Best Buy erased everything off of my computer including all of my pictures. I had LOST all of my pictures and just recently FOUND the majority of our Honeymoon pictures! It made me so sad when they were erased! Don't even get me started on how annoying/mad/frustrated losing pictures makes me! There are still a lot of pictures missing...when Kevin and I were dating...freshman pictures...etc. Luckily my in-laws had a lot of our Honeymoon pictures uploaded to their computer as they were played on a slide show at our Open House in Kansas City, Missouri! I just barely got a CD with those Honeymoon pictures! THANKS SO MUCH Greg & Kathy :) Lifesavers. 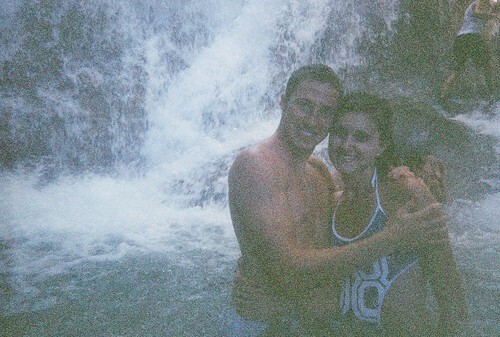 Today I just picked up a CD at Walgreens of pictures we took when we went on a trip to Dunn's River Falls in Jamaica. Dunn's River Falls is a huge waterfall that we got to hike up. Incredibly gorgeous and definitely a great memory! We purchased an overpriced water camera by the attraction and then got the film developed in the states. Somehow we lost the CD but I found the negatives recently so I ran them to Walgreens to get put on a CD! For $5.99, 23 pictures are SO worth it! 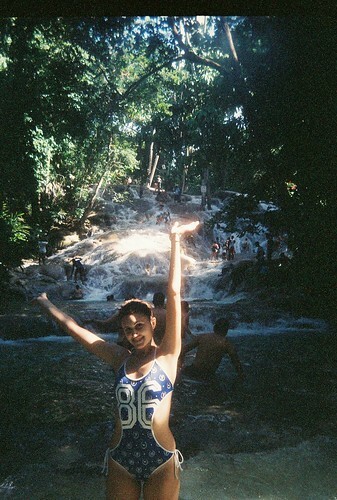 Here are some of the pictures from Dunn's River Falls I am so excited to have again! Here we are at the top of the waterfalls! You can see some of the waterfalls area...Kevin and I are in the middle hugging! One of the waterfall guides would take pictures and the husbands would always pull the wives into the waterfalls for the picture and for some reason I don't think I was expecting it! I don't know how I wouldn't though? It's kind of a funny picture. I have a confession. I am a HORRIBLE swimmer, like I really am bad. Not knowing what is in the ocean kind of freaks me out. There could be big eels or creepy looking fish (like not in a good way) and jellyfish and stingrays. Somehow the unknown of the ocean is not my thing. Here we are snorkeling and when they said they had life vests I knew I had to have one. I am SO pathetic! But how could I focus on breathing through the tubes AND swimming? I honestly am a bad swimmer, like, I need/should take lessons or just swim everyday to get better! Anyone else bad at swimming (but really, don't be shy)? There was a class at BYU called Swimming for Non-Swimmers...haha...and I thought I should take it with my friend but I didn't get around to it. Also, when I have kids like not now obviously because I'm not pregnant, but like what if I take them to lessons and they are way better than me? I should probably learn. I feel like I'm drowning though. This is so embarrassing so I should stop talking. Friends, back up your computers OFTEN! I have known many friends to lose all of their pictures...so sad! I am pathetic as you girl. I know exactly what you are talking about!!! Oh my! What an AMAZING honeymoon!! Seriously! Fun pictures!! Looks like you had a blast. Glad you were able to recover most of the pictures. I am so scared I'm going to lose my one day. I need to back them up! Ok, if your husband likes fishing and snowmobiling AND baseball, we definitely have to get together. James needs guy talk! I think we're going camping/fishing on the third for one night up at red feather. It's just some people in our ward but James is going to fish for sure--and we would LOVE to watch or go to a game. We've been wanting to get a babysitter and take a night downtown for so long! James is always trying to go to games! 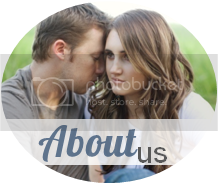 CUTE blog and cute pictures! following..now! Glad you found your photos- they are priceless! 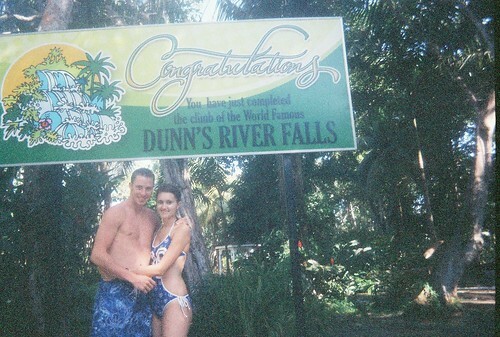 We've been to Dunn's River!!!! My family and I go on a mission trip to Highgate, Jamaica every summer. 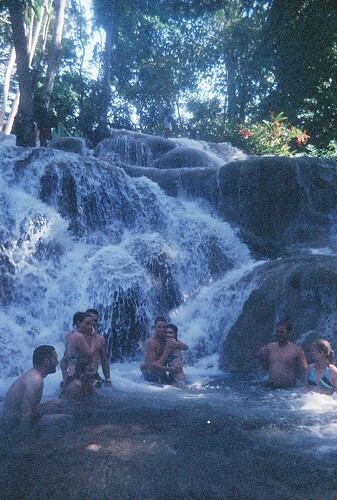 On our "off days" (Saturdays), we take a group to Dunn's River. This past year was my first year to go to the falls and I LOVED IT!!! We didn't have a guide...just did it ourselves...we climbed the falls twice! :D Fun stuff!